In another year, or maybe a little more, Mack will introduce a new model to the Australian market. It will be the Mack Anthem and on the surface, it’ll simply step into the shoes of the current Granite model. Have no doubt, though, this radically restyled replacement means much more to Mack in Australia than the supplanting of one model for another. Far more than a bold new look and an intriguing new name, it comes with attributes which will flow to almost every model in the current Mack range. In part or in full, Anthem represents a redrawn line in the sand for Mack both here and in its US heartland. Evolutionary more than revolutionary, it is nonetheless a milestone model which marks that point where the status quo has been refashioned, reformed and roundly rejuvenated in a bold bid to dramatically broaden the bulldog’s business horizons. It is all part of a detailed story which, obviously enough, starts in America but also stretches deep into Mack’s modern history on both sides of the Pacific: First launched with great fanfare and hype in the US in the back half of last year, and showcased more recently as one of very few new models at the Mid-America Trucking Show in Louisville, Kentucky, Anthem is the pointy end of a deliberate and carefully planned assault on the North American interstate linehaul business. Yet as several Mack senior executives in the US conceded, it won’t be easy cracking bigger numbers in a North American market not only rife with powerful competitors, but also a large sector of the market which for many years has not viewed Mack as a front-line candidate for long distance work. The thing is, while Mack continues to perform particularly well in heavy-duty vocational roles such as waste collection, concrete deliveries and sundry specialist applications, the North American long distance sector over the past few decades has not been a happy hunting ground for the legendary bulldog. Still, it hasn’t been for a lack of trying. At least, not completely. Models such as Vision and the current Pinnacle have managed to maintain a Mack presence in North America’s premium long haul sector but from any angle, the presence is marginal, at best. Even so, during a special Anthem presentation at Mid-America, Mack Trucks executives including senior vice-president of sales and marketing, Jonathan Randall, and director of product strategy, Roy Horton, conceded that Pinnacle is today a ‘tired’ design. Strangely, they were just as quick to refute any suggestion the model has failed to meet design objectives or worse, been an unsuccessful product. High hopes. Mack Trucks senior vice-president of sales and marketing, Jonathan Randall. Expects Anthem to eventually take Mack to double digit figures in the US premium Class 8 category. 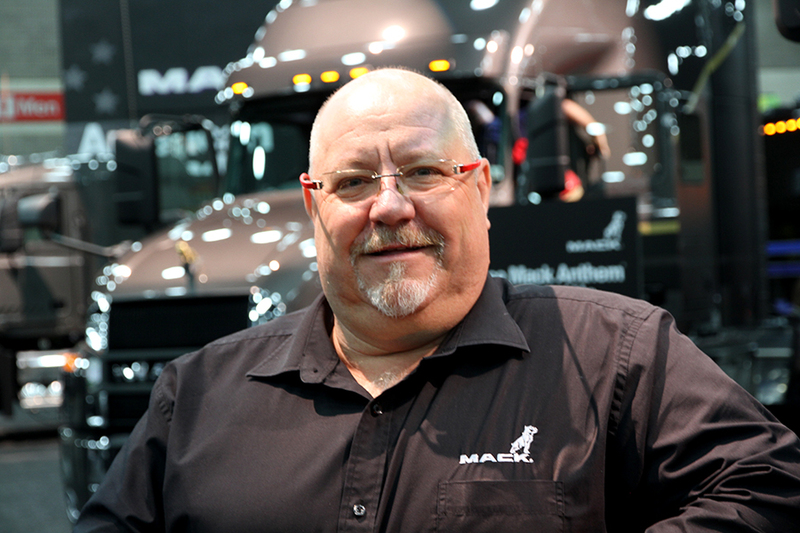 Their contention, it seems, is that each time Mack has aspired to a higher level of competitiveness in highway roles, first with Vision and later Pinnacle, market heavyweights have responded by releasing even more enticing products. The result, invariably, has been that the bulldog has come up short, left scurrying for the attention of customers who for any number of reasons had come to view Mack as something other than a mainstream interstater. Consequently, the numbers speak for themselves with recent market figures showing Mack holding a puny 1.5 percent or thereabouts of America’s premium linehaul market. Hardly the stuff of legend. Yet it wasn’t always that way. Not by a long shot. Back in the mid-70s, Mack was a seemingly indomitable powerhouse in the US long distance business and just as it is today, a powerful player in vocational roles. By any measure, a potent and forceful market leader. A builder of tough trucks with its own gutsy engines and enduring drivelines, and recording that era in canine chronology, a museum in Mack’s customer centre in Pennsylvania is crammed with priceless examples of the dog’s glory days. However, as history has demonstrated with various brands over the past half century or so, Mack back then made the near-fatal mistake of becoming a company convinced of its own invincibility and entitlement. A company where its top executives flew around the US in a small fleet of corporate aircraft, lounging on the executive excesses of arrogance and apathy. All while competitors kept pushing the product envelope to ever higher heights, ultimately leaving the beleaguered bulldog to chew on what was left of an increasingly bare bone. Of course, something had to give, and it did, with French automotive entity Renault first coming to the rescue of the ailing dog. As events would soon show though, the French weren’t particularly good at fixing their own problems, let alone Mack’s. Fortunately, the pragmatic Swedes took an interest and Mack ultimately became an integral part of Renault’s ‘assimilation’ into Volvo’s burgeoning empire. Salvation! While all this was going on, Mack’s prominence in the linehaul league was being continually whittled to the point where the famous bulldog brand became little more than a blip on the radar. Meantime, low slung cab-over models which historically targeted vocational roles and have for decades returned consistently strong results, gave rise to the belief that Mack’s new owners were perhaps content to leave linehaul to the major players and instead, concentrate on the less glorious but undeniably valuable vocational sectors. Then last September, along came Anthem to batter that belief into oblivion. 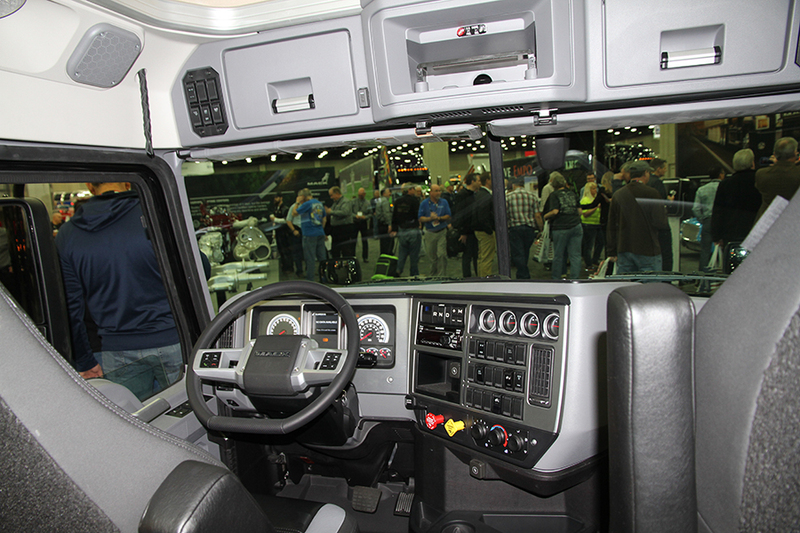 Inside view of an Anthem cab on display at the Mid-America Trucking Show. Practical efficiency and driver convenience were high on the design agenda. Suddenly, with a stand-up cab and fully integrated 70-inch sleeper for the first time, plus a swathe of similarly new features including advanced wiring and electronics systems, vastly greater emphasis on driver comfort and convenience, and the standard inclusion of the Bendix Wingman stability control package, Mack was back in the long distance highway business. Or at least, back in the bidding for a bigger bite of the bone. Again, it won’t be easy in a conventional truck market where the likes of Freightliner, Kenworth, Peterbilt, International, and corporate kin Volvo are sure to be less than partial to the emergence of a dressed-up dog with a rekindled liking for life in the fast lane. Like it or not though, Mack in the US now appears better prepared for a linehaul lunge than any time in the past three decades or more. Likewise, the timing of Anthem’s introduction probably couldn’t be better with a strong American market continuing to buy trucks in huge numbers, providing Mack with an ideal platform to start on the long road to what Jonathan Randall predicts will eventually be a double digit slice of the premium linehaul business. Ironically, while Volvo and Mack are arch rivals in North America – due in no small part to the US market’s almost total reliance on conventionals – Mack insiders are adamant that Anthem is a significantly more premium product than its Volvo counterpart. What Volvo thinks of that contention remains unknown but it’s unlikely to be favourable given the Swedish brand’s notably higher take of the linehaul business than its bulldog brethren. 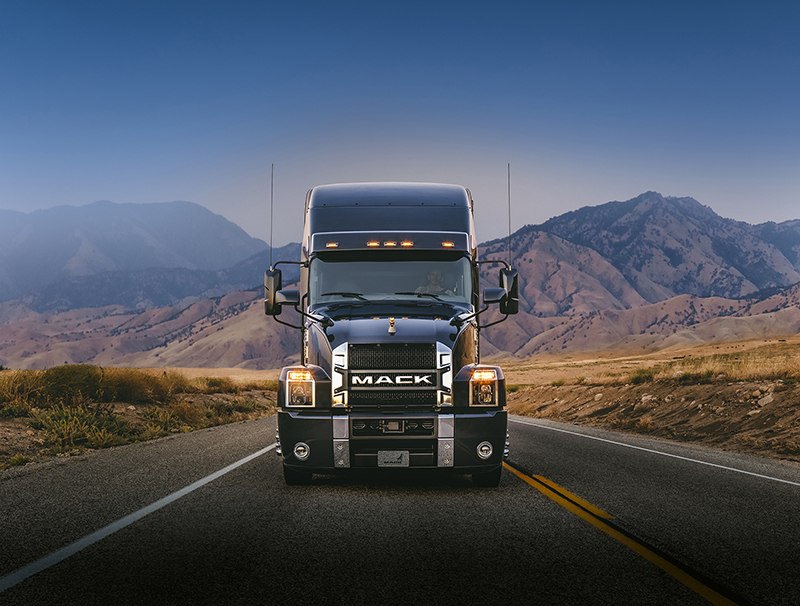 Whatever the case, you’re left with the distinct impression that in the US, Mack views Volvo as just another competitor in a hugely competitive market. And no doubt, vice versa. In the big picture though, there are far greater plans in play than the competitive instincts of two corporate cohorts. As chief executive and president of Volvo Group Martin Lundstedt told US President Donald Trump in January this year during a high-level dinner of global business leaders, the group intends to invest "north of two billion dollars" in development programs around its two North American nameplates. So, Mack or Volvo, the corporate objective remains the same: Growth on a grand scale. 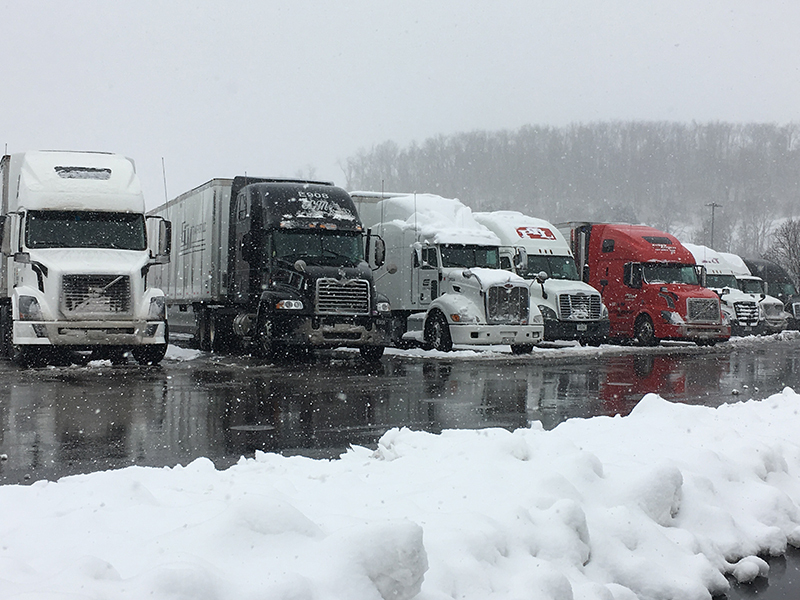 A lone Mack stands out in a snowy US truck stop, surrounded by prominent linehaul brands including corporate cohort Volvo. Mack’s presence on the US interstate scene is minimal but the hope is Anthem will bring a new era. All this has unfolded while Mack’s Australian operation and the models it produces have to a large extent over many decades, evolved and expanded under their own steam and in many respects, remote from US influences. What’s more, while Mack has struggled to build a significant presence in the North American on-highway market, in our part of the world the bulldog has at least maintained a respectable following in linehaul work despite the inevitable upheaval of corporate acquisitions. In fact, Mack’s heavy-duty fortunes have grown progressively stronger under Volvo’s reign and according to the brand’s local leaders, they’ll grow even stronger once Anthem’s features become an ingrained asset in all models except the shorthaul Metro-Liner. No question, Volvo’s ownership of Mack has had dramatic influences here and overseas but for the most part, and despite the protestations of Mack loyalists seemingly oblivious to the dog’s previous predicaments, those influences have been hugely positive. Of all the positives, though, there are none greater than the fact that if Volvo hadn’t bought Mack, the dog would be dead. Simple! Even so, when Volvo took over, Mack cab-over models were quickly deleted from the Australian line-up while Volvo also dumped plans for a new conventional model sourced from the US. The plan for Australia was plain and profound: Unlike the US where it’s an all-conventional market, Mack in Australia would sell conventionals only and Volvo, cab-overs only. Despite the clear lines of competition, it remains hard to think of two more culturally opposed brands anywhere in the trucking world than Mack and Volvo, and the merging of the two entities under a single corporate banner has not been without its issues, in the US and Australia alike. Yet Mack has been fortunate. Very fortunate! For starters, the introduction of advanced, efficient and fully integrated Volvo Group powertrains and drivelines is, in principle, not dissimilar to the all-Mack engine and driveline dogma of days past. Critically, Mack has also been encouraged – not that it needed much encouragement either here or in the US – to staunchly maintain its classic identity and nowhere does this appear more evident than in Australia where the bulldog heritage of tough trucks working in tough toil is alive and well in models unique to Australia. And vitally, built in Australia. Maybe much of the Australian operation’s apparent autonomy stems from our righthand-drive configuration but from the outside looking in, it can appear more than a tad obvious that historically, Mack Australia has been largely free to do its own thing in the development of models for this country’s conditions. Trucks like Titan, Super-Liner, Trident and Metro-Liner are blatant proof. Shorthaul specialist. 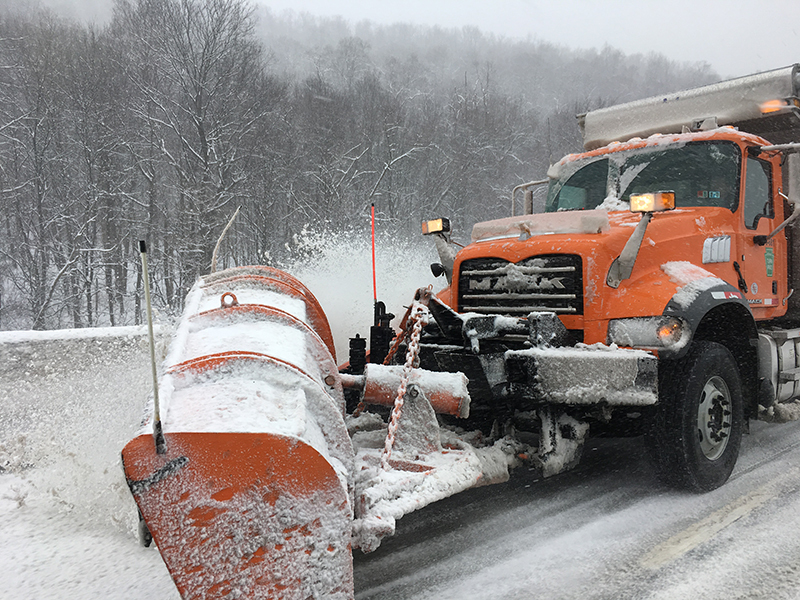 A US Granite model clears snow from an interstate highway. In Australia, Anthem will replace Granite completely. That freedom, however, is not infinite. Never has been, and never will be in a commercial world where costs and return on investment continually, and increasingly, dictate what’s feasible and what’s not. Admittedly, local production at the Wacol production plant in Brisbane continues the long established ability to engineer the many changes relevant to Australian conditions and needs; fuel capacities, wheelbases, cooling packages, weight distribution, and even some modifications to the cab, inside and out. 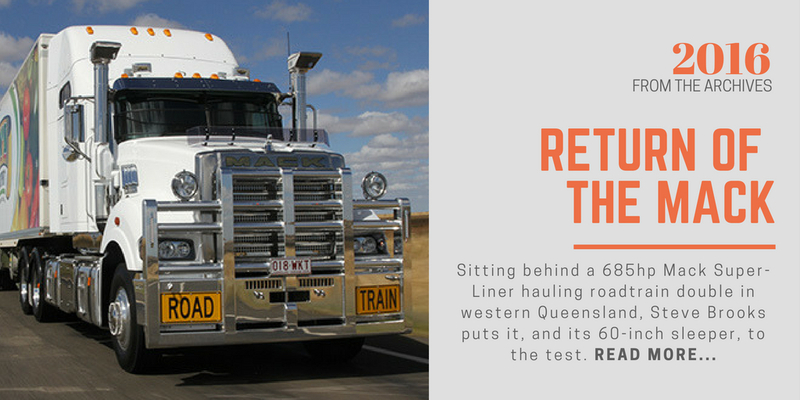 Structurally, however, the pattern is largely set by the fundamental designs forged in the US and when it comes to the long-serving, all-steel cab shared by all Mack models in Australia, not a great deal can be done to alter the core structure. The economic viability of major re-engineering of the cab for the relatively low volumes of the Australian market just doesn’t stack up. Therein, resides a problem. The problem of a cab, durable and proven as it most certainly is, lacking those modern integral features now available from competitors. One competitor in particular. Kenworth! It is, of course, no great revelation to report that Mack does not currently have a stand-up cab. Nor is it unreasonable to suggest that Mack’s in-cab layout is today staid and in need of an update. It has been that way for quite some time and all things considered, a potent and efficient ‘group powertrain’ led by MP8 and MP10 engines feeding into a slick mDrive automated shifter has been a major factor in maintaining Mack’s market strength despite aged designs in other areas. However, the emergence of Kenworth’s new T610 and before much longer, the T410, further exposes Mack’s shortcomings and increases the pressure to mount a substantial challenge if it hopes to stifle Kenworth’s commanding leadership of not just the heavy-duty conventional market, but the heavy-duty market in general. After all, given the lacklustre inroads of Freightliner and Western Star conventionals in recent years, who else but Mack currently has the capacity to check Kenworth’s momentum with the T610? And this is where Anthem comes into the picture. Big time! 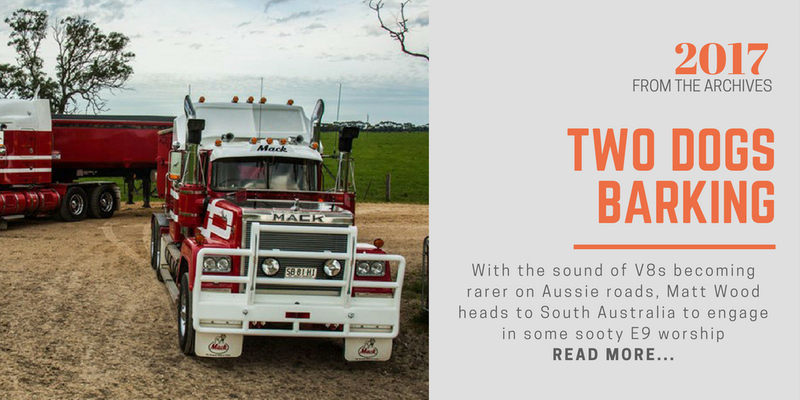 For the head of Mack Australia, the ‘Big Dog’ himself, vice-president Dean Bestwick, Anthem simply can’t come quick enough. Admittedly, the burgeoning early success of Kenworth’s T610 has been a driving factor in making Anthem a priority, but it’s an adamant and justifiably exuberant Bestwick who insists the truly big motivation is in the potential Anthem provides for Mack in everything from single trailer to truck and dog work, to linehaul B-doubles and roadtrain duties. Again, however, the full Anthem package with the radically restyled hood will only be seen in the direct replacement for the current Granite model. Critically though, it’s what Anthem provides on the inside for Titan, Super-Liner and Trident that has Bestwick and his bulldog brethren most excited. It’s still early days and while the Anthem package for Australia is currently being defined and refined, the long-awaited arrival of a fully integrated stand-up cab coupled to a range of well-equipped, locally trimmed sleeper options has Mack drooling with anticipation. 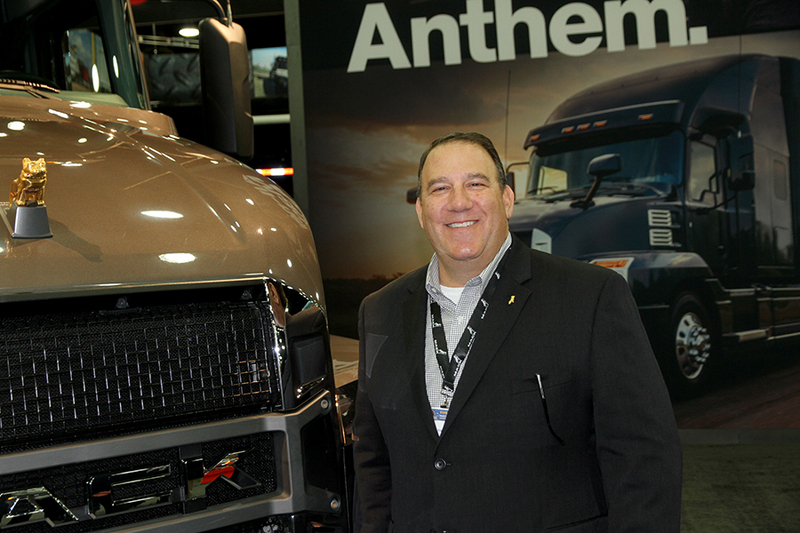 "Anthem will give us a massive boost," said an unashamedly upbeat Dean Bestwick during an impromptu interview in the spacious surrounds of an Anthem cab and 70 inch sleeper on the Mack stand at the Mid-America truck show. 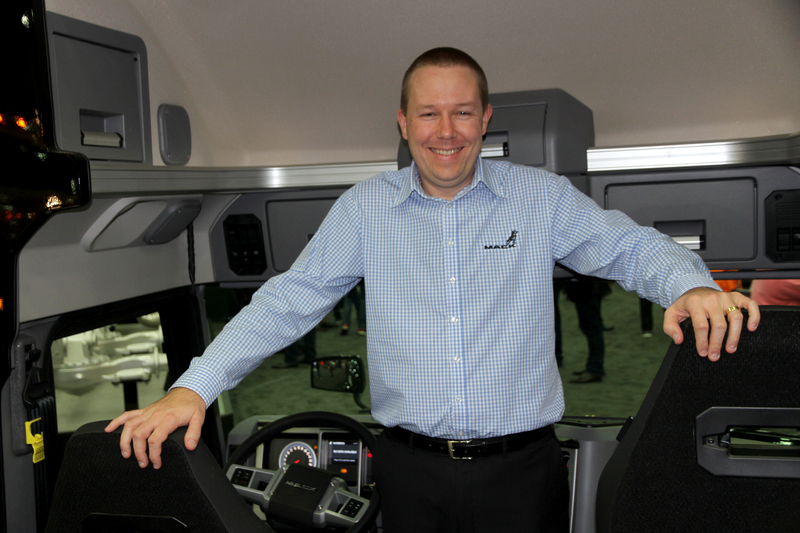 Another visitor to Mid-America was Volvo Group Australia senior product manager Scott Simpson who will have a major hand in Anthem’s testing and validation for the Australian market. Calm and thoughtful, it was a candid Simpson who confidently remarked, "There’s a lot to like and from what I’ve seen, there are no glaring issues in durability terms. The gusseting they’ve done to strengthen the cab for the higher roofline seems really strong. "It’ll go through plenty of testing before it’s released in Australia," he added, "but we already know this is a durable cab and with Anthem there are a lot of improvements in a lot of areas. "I’d say they’ve done a really good job with it." High praise from a man with an engineer’s natural propensity for cautious commentary. Meantime, back in the show truck, a succinct Dean Bestwick continued, "We’re competitive now with our current range of models but the things Anthem provides will make us even more competitive. Far more competitive. "It’s a new ballgame for us. 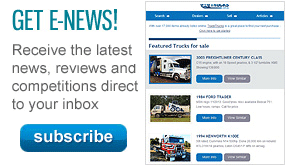 The days of building trucks from the ground up for Australia can’t be done anymore. The numbers, the economics, just don’t stack up. The world has changed. "We need more from America and Anthem provides the things we want. Simple as that." Volvo Group Australia senior product manager, Scott Simpson. "… we already know this is a durable cab and with Anthem there are a lot of improvements in a lot of areas." Code-named the P7605 project, Anthem was more than four years in development and testing before production started in earnest last February at Mack’s Lehigh Valley (Macungie) facility in Pennsylvania. The Macungie plant was built during Mack’s glory days in the mid-70s and according to Rickard Lundberg, a production specialist from Volvo Group Trucks, and vice-president and general manager of the Lehigh Valley operation, not a great deal of reinvestment went into the facility in the years leading up to Anthem’s development. Anthem, however, has generated significant change, developed in sync with an US$84 million rejuvenation of the Macungie plant. What’s more, it didn’t take a long tour inside this remarkably clean and orderly factory to accept Lundberg’s assertion of a production facility which now reflects the best standards of its corporate counterparts anywhere. It is, he explained, all part of a concerted effort to create an emboldened new future for Mack, and Anthem is the key. The key to the start of a new era, arguably best defined by Rickard Lundberg’s statement that production of Mack cab-over vocational models has dropped to around 20 percent, coinciding with greater production space now being given to conventionals in anticipation of Anthem’s acceptance in the US market. A few hours’ drive away in Hagerstown where the MP8 engine, mDrive automated transmission and rear axle assemblies are produced for the North American market, it’s much the same story of renewed investment as Mack prepares for an expected increase in volumes on the back of Anthem uptake in a strong US truck market. Interestingly, Hagerstown produces only rear axle assemblies for the Australian market, with our MP8 and MP10 engines and mDrive transmissions supplied from Volvo Group factories in Europe. Whatever, it’s all good news for Dean Bestwick. Like a big kid in a toy factory, the wide grin as he pointed out different cab and sleeper combinations while various Anthem models travelled down the Macungie line revealed the remarkable level of excitement surrounding Anthem’s potential for Australia. "When I first heard of this project about four years ago, I couldn’t get to the US quick enough to see what was in it for us, and right from the start I knew there was plenty," he said with absolute conviction. "The more the development went on, the more I could see it had the things we want, and the more I let everyone know we wanted them and needed them." Test truck. Anthem currently comes in three forms – day cab, 48 inch lo-roof sleeper (pictured), and the flagship stand-up cab with 70-inch sleeper. On the inside, it’s a major advance over existing designs. Without too much surprise, top of the list was a greatly modernised version of the existing cab structure which allowed a tall driver of 1.8 metres and more (six feet-plus) to stand upright from the driver’s seat and access a large, well-equipped sleeper section. It’s something which Dean Bestwick admits has been high on the ‘wish list’ for a long time, along with a substantially modernised dash and control layout. In Anthem, Mack gets both, plus plenty else. As things stand at the moment, Anthem is offered in the US as a day cab and two sleeper models, one a 48 inch flat-roof unit and the other, the flagship 70 inch sleeper version with generous standing room from the driver’s chair to the bunk. Dean Bestwick, however, admits he’s eager to see development of a shorter sleeper with the high-rise cab, specifically for Australian B-double applications. "We want everything Anthem has and we’ll be aiming to tap as many options as possible," he emphasised, citing an extensive range of trim and equipment packages for both the cab and sleeper. Righthand-drive Australian models will, of course, be assembled at Wacol, with cabs arriving largely in bare bones white, and all paint, trim and internal fittings done in the Brisbane factory. 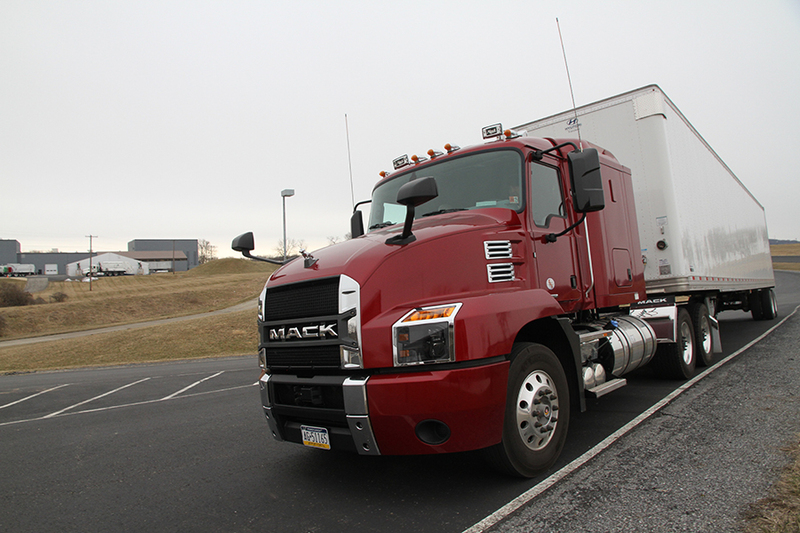 Meantime, a short drive from the Lehigh Valley plant, Mack’s customer centre sits aside a test track which on a cold and snowy Pennsylvania afternoon provided the opportunity to get behind the Anthem wheel for the time. A few hours was certainly enough to whet the appetite with two engineering development units provided for stints on the track - one a day cab, the other a flat-roof sleeper model. Each towed a loaded trailer and was powered by a 430 hp version of the 13 litre MP8 engine (the biggest displacement now used by Mack in North America) driving through the mDrive automated transmission which, like its competitive counterparts, continues to find favour with US operators as driver convenience and retention become increasingly important. So, let’s start with the most obvious feature of all: That hood, which apart from its unique appearance also uses an innovative locking mechanism behind the lower edge of the grille in place of normal lock-down clamps on the rear corners. What’s more, Mack insiders says the grille design not only enhances aerodynamic efficiency and fuel economy, but also provides ample airflow to further aid cooling capacity. 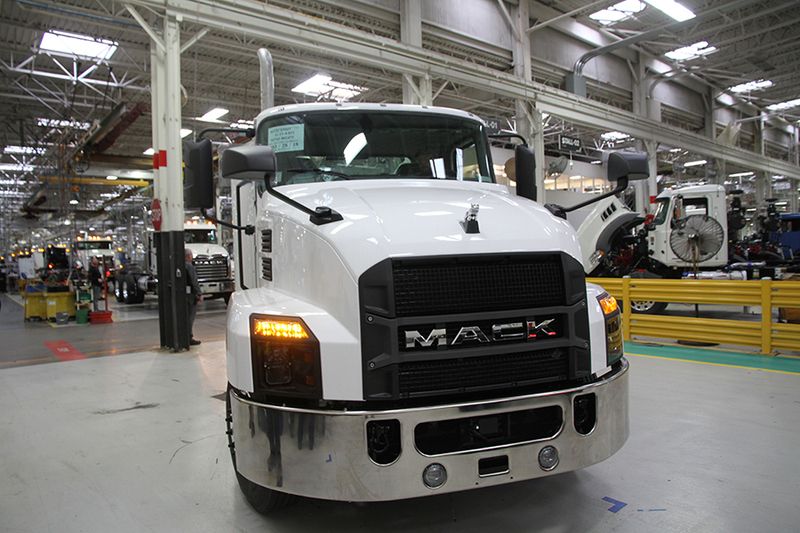 ‘Plain Jane’ version of Anthem rolls off Mack’s Lehigh Valley production line in Pennsylvania. Anthem development coincided with an US$84 million rejuvenation of the long-serving factory. Anyway, while first pictures of Anthem may have conjured thoughts of a chunky mix of meccano with a touch of Tonka, the consensus among our small group was that it’s a truck which actually looks far better in the flesh. Even appealing, and quintessentially Mack. Still, opinions are sure to vary but there is, of course, much more to Anthem than first meets the eye. There’s no question, for instance, that the majority of existing Mack models in Australia will benefit greatly from Anthem’s assets, especially on the inside. For the driver, it’s a hugely improved environment with main gauges and instruments ideally sited each side of a central digital information screen, while the layout of control wands and switches for a multitude of current and new functions is neater and vastly more practical than the current outdated design. Like the hood, though, some will find the steering wheel odd with its straight section near the driver’s waist. Unusual, sure, but also a very clever and effective way of increasing belly room for those with a generous girth, especially the short, stumpy types who need to be up close to the wheel. That’s about it, for now. It was a tad disappointing not to drive a stand-up cab version with the 70 inch sleeper but a close look at models on the Mack stand at Mid-America at least highlighted the extensive work that has gone into making Anthem a linehaul truck with all the space, convenience and creature comforts of a premium player in a tough game. Yet despite the excitement of Anthem’s obvious potential for Mack in Australia, there’s a long road to travel before the new model and its feast of features make their way onto our market. The hard work, in fact, starts now. It’s no secret Australian conditions can extract frailties like nowhere on Earth and for this reason above all else, a batch of four Anthem development units – three sleeper models and a day cab unit – are about to undergo what Dean Bestwick described as, "high frequency testing on bad roads in single trailer, B-double and roadtrain doubles applications. "We’re confident the trucks will be right but we’ll be even more confident once they’ve worked hard in our conditions." Particular attention, he added, will be paid to Anthem’s electrical systems and features, and obviously enough, structural integrity of the high-rise cab and sleeper. As for the duration of the test program and a possible introduction date, a serious and unusually cautious Dean Bestwick concluded, "Anthem’s introduction will depend on the quality levels achieved through the testing program and validation process. "We’ve been waiting for Anthem for a long time. A little while longer won’t hurt if it means making sure everything’s right." 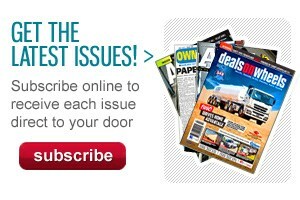 Absolutely, but don’t be surprised if Anthem is Mack’s masterpiece at next year’s Brisbane Truck Show. Two Dogs Barking: Praise V8 Diesel!